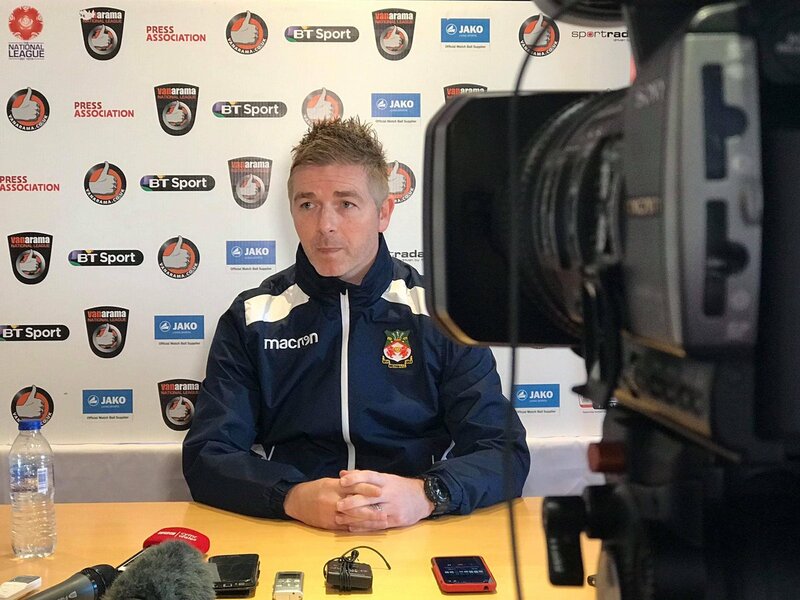 Wrexham FC manager Bryan Hughes. Wrexham gave notice they are going to scrap and battle for success under new manager Bryan Hughes. Their 1-0 home win against Dagenham and Redbridge was testimony to the team spirit and togetherness in the Dragons camp. Substitute Stuart Beavon scored a 74th minute winner for Wrexham, who moved third in the Vanarama National League table. Leaders Leyton Orient are two points ahead of Hughes’ team, who are intent on earning promotion back to the Football League. The turning point came when Hughes sent on Beavon and Paul Rutherford and the manager said: “We needed a little more energy, a little more impetus in those forward areas. “Going forward, we just needed a lift and credit to Beavon and to Rutherford. They are the type of players who can do that. “The substitutes made a real big impact after they came on. “We had numerous chances to kill the game off and could have made it a lot easier for ourselves, but the players did what was asked of them. “I wanted to see that togetherness, a unified approach. Late on, that was there in abundance. “We defended like trojans at times. Credit to Dagenham, who threw everything at us at the end, but we defended well. Liverpool-born Ben Tollitt made his full Wrexham debut, playing alongside Bobby Grant and Cole Stockton in a front three. “It was about trying to make an impact,” said Hughes. “We haven’t scored a lot of goals this season and I was trying to change the front slightly. “I gave Tollitt a chance up there and he was excellent. I wanted to us to be on the front foot, but it was hard during the first half because Dagenham did do a job on us. “The game became a bit more stretched and the best thing for us is we had players who could impact the game when it became stretched. “It didn’t feel as though we were in any great danger. The defence looked solid and attacked everything, especially late on. “We could have made it a lot easier for ourselves. Akil Wright had numerous chances to put the game to bed but it just wasn’t his day in front of goal. The next test for Wrexham is at Havant & Waterlooville next Saturday before they travel to Gateshead. Hughes’ team selection showed four changes from the win against Maidenhead a fortnight earlier with Luke Young, Bobby Grant, Cole Stockton and Ben Tollitt starting. Goalkeeper Rob Lainton kept a 17th clean sheet in the National League and Hughes will be looking to build on that foundation over the final 14 fixtures of the season. Wrexham recording back-to-back home wins and clean sheets. Wrexham AFC: (4-1-2-3): Lainton, Roberts, Lawlor, Pearson, Jennings, Walker, Young (Carrington 90), Wright, Grant (Rutherford 57), Stockton (Beavon 57), Tollitt. Subs not used: Dibble, Holroyd. Dagenham & Redbridge: (4-4-2): Justham, Onariase, Clark, Goodliffe (McQueen 80), Gordon, Nunn, Robinson, Wright, Loft (Hardfield 80), Reynolds, Wilkinson (Kandi 46). Subs not used: Moore, Smith.